When “centrists” care more about the GOP base than the Dem base, bigotry gets legitimized. This is *the* playbook. GOP does it w/ virtually every Dem figure who isn’t a white male: otherize, demonize + splinter. This is different than being moderate on policy. I may disagree w/ approach (keeping the ACA as-is w/small tweaks, etc), but at least that’s a policy convo. But to make decisions based on the political efficacy of a bigoted argument gives that bigotry power, & that’s a problem. 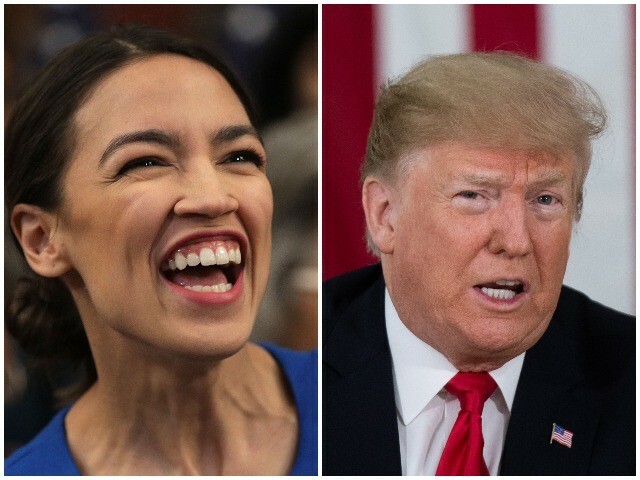 President Trump is more popular than Rep. Alexandria Ocasio-Cortez and New York City Mayor Bill de Blasio in the deep blue state of New York. Buried in a Siena College poll is the fascinating news that Trump earns 36 percent support in one of the most left-wing state in the country; which is not terribly surprising or terribly high, but it is higher than two of the state’s most famous far-left Democrats. Ocasio-Crazy’s state-wide approval rating currently sits at a terrible 31 percent, while de Blasio does only a little better at 34 percent. Trump’s unfavorable ratings is about where you would expect in a state like New York — 60 percent. De Blasio’s unfavorable rating, however, has hit 50 percent. Ocasio-Crazy’s unfavorable rating has already hit 44 percent, even though the freshman congresswoman has been a national figure for only a few months. This is now the third piece of terrible polling news for Ocasio-Crazy in nearly as many days. On Friday, Gallup found that Ocasio-Job Slayer is extremely well known throughout the country and that the more people know her the less they like her. Compared to September, Ocasio-Job Slayer’s unfavorable rating skyrocketed 15 points, from 26 to 41 percent, while her favorable rating jumped only seven points, from 24 to 31 percent. She is currently ten points underwater. On Monday, in this same Siena poll, we learned a plurality of New Yorkers (38 percent) see her as the villain in her quest to deprive New Yorkers of some 25,000 Amazon jobs. A mere 22 percent see her as the hero. Yes, even though the establishment media made Ocasio-Job Slayer its poster child for all that is beautiful and socialist in the world, there is no question that coverage backfired in the worst way.